OMG after a long time of work and WORK and frustration, my website is LIVE once more. 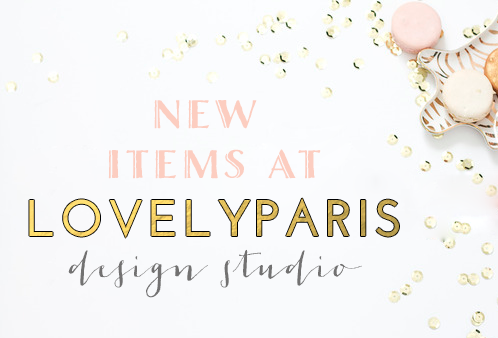 I am so excited to be able and get really serious about LovelyParis Designs. I love it. I love designing, and I found that I am that weird person that gets excited about fonts! Yes, fonts. Creativity is such an amazing thing and I am so glad to be able to share that with other people and create things that people like. I already made a post about designing and all of that shenanigans, so this post isn't going to be that again. But I just wanted to say that I have come such a long way from how I use to design to the know. I stopped for months got back into it and stopped again, but I just love it so much! So yes, I have launched my site and I am super happy. Okay, so I purchased the domain (So you know its serious), and started creating. I didn't want to put too much on the design of the site, just because I wanted it to look clean and sweet. Oh, and I gave it sort of an edgy look! I was really inspired to go edgy-Parisian. With pink, black, white and red! I know it is a weird color combination, but I feel it works. I decided to create my site on Blogger because I just know my way around Blogger. I did use SquareSpace before this, but it was WAY expensive and designing was really frustrating because I didn't have much to work on. So I messed around with Blogger and finally got my site looking the way I wanted to. So yeah! The design also is a little reflection of this blog. They are both my favorite things and I wanted to incorporate a little bit of both in..both. That is why I wanted to add the little circle tabs on the design just like the once on here, but at the bottom instead. Let me tell you,getting that site to do what I wanted it to was no easy task, but I am so HAPPY that it is live and ready TO GO! Instead of writing a really long post, I am just going to stop there, because it is 2:30am and I have to be up at 7 (uh oh!). PS: I hope that you guys like the site. Let me know what you guys think! It has been a while, I know. But here I am with TWO BRAND NEW TEMPLATES! I have been working on many designs and design ideas the past couple of weeks and I couldn't wait to share them with you all! So here they are! Nova Isabelle was inspired by one of my most popular blog templates, Emma Valentine and so I decided to use the same out line and "theme" to this one, except Nova Isabelle is a bit more darker and edgy where as Emma Valentine is a little bit more sweet. So I decided to make them sister templates! :). I love the way it turned out! I actually started this template one night around 11pm and finished it at EXACTLY 5am! I just couldn't go to be without it being finished. 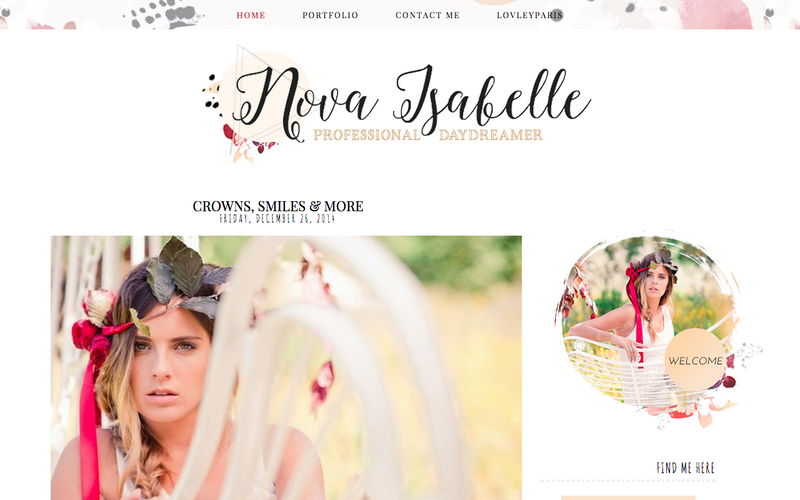 Nova Isabelle is an edgy bohemian style blogger template that is great for any blogger! With dark reds, blacks and a hint of coral, Nova Isabelle is sure to give your blog a fresh, flowery look. The name Nova Isabelle is actually the name I want to give my daughter (whenever I have one of course!). It is going to be Nova Valentine, but that name was already taken on the last template. I chose Isabelle because that is MY middle name, except without the extra "le. So yeah, that is Nova Isabelle!!! You can Click on the Image to See it Live! For this template I decided to go a bit more modern, yet have a fun twist to it and I made sure that there was a little bit more details to it than just a plain "modern" template which tend to lack details. I believe that the more the detail, the better the blog looks, but that is just my opinion. I got the inspiration for this one when I was looking at other blogs on Wordpress. I know that Wordpress allows people to add a bit more stuff than here on Blogger, so I decided to make on close and for the Blogger Platform. I love the way this one came out too! It is professional enough that anyone can have it, but it is also fun! There is also not that much going on which also keeps it clean. For the name of this one I just kind of came up with it on my own while I was waiting for my mom to come out of a doctors appt. 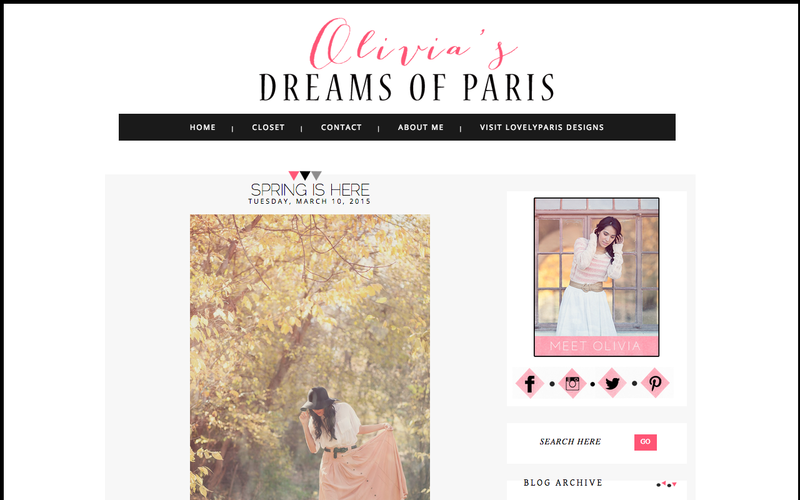 So that is how Olivia's Dreams of Paris came to be! This one actually took me from around 11:30am- 4:00pm to make. 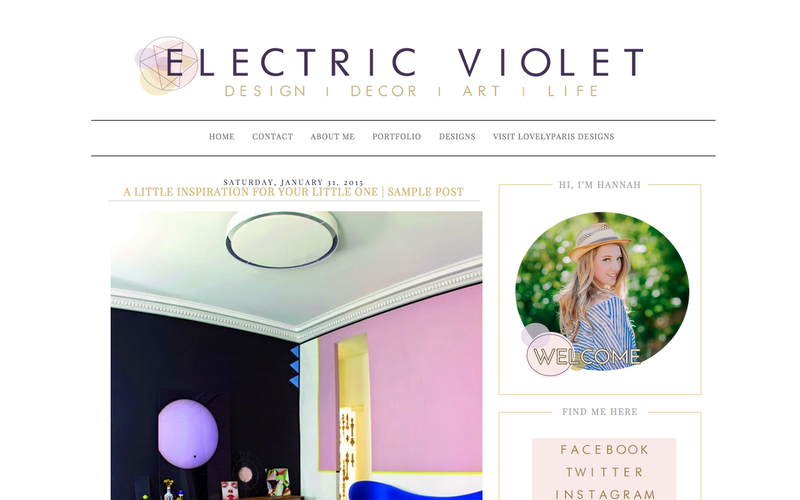 Electric was inspired by the cutest little nursery layout created by LayBabyLay. Seriously she is the best one to do those inspiration boards for nurseries! So anyways, she has an inspiration board called "Electric Lilac", so I used that to create Electric Violet. But mine is grown up! This template is very simple, yet it has a bit of colors and it is very clean. I love this one. It came out great and I loved being able to look at Electric Lilac for the inspiration. For the sample pictures I chose on of my favorite designers from DesignLoveFest. Her photography fit perfectly with this theme! 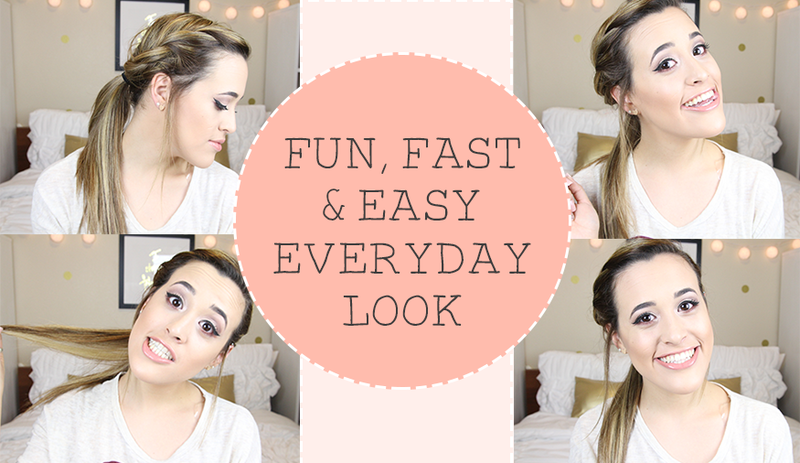 She is such an amazing creator, so make sure to go check her out! And yes, that is Electric Violet. And that is what is New at LovelyParis. 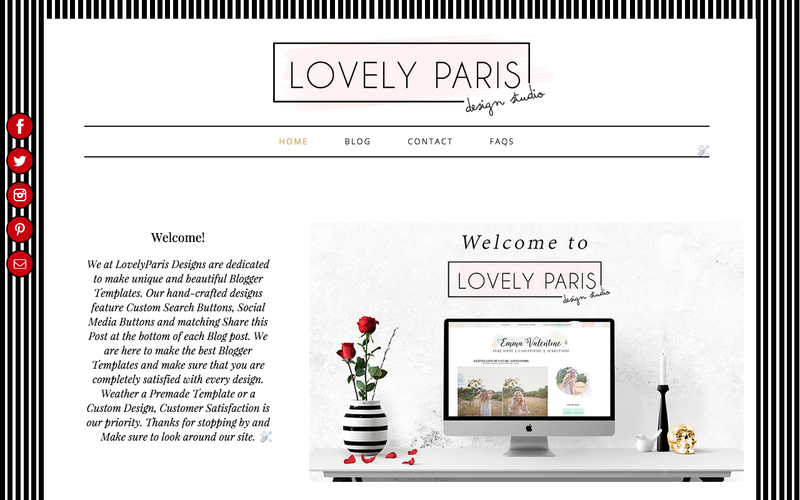 I am still trying to come up with a good designs for LovelyParis so that it why I still don't have a site. 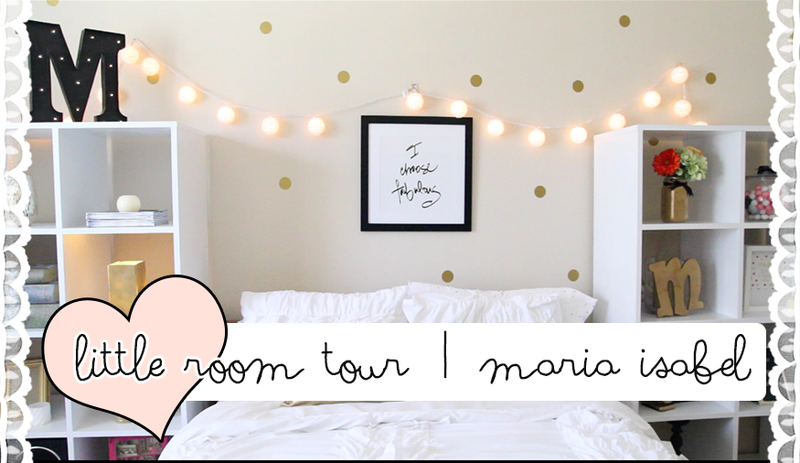 And I also posted a new video on my channel all about my Birthday Haul ! So make sure to check it out and subscribe! !